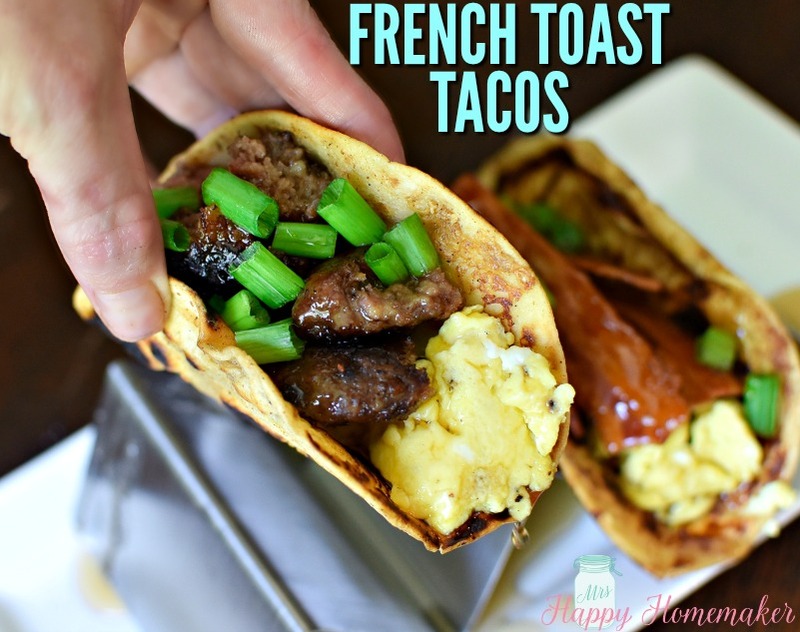 These FRENCH TOAST TACOS are my latest breakfast obsession. 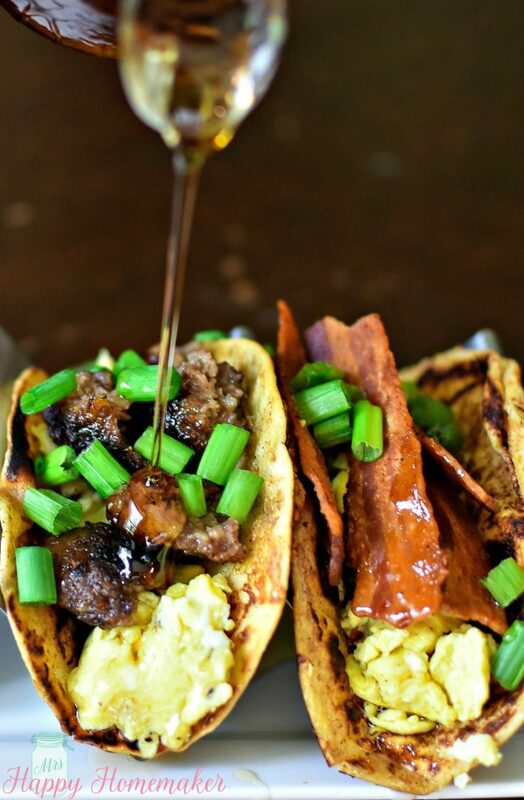 Flour tortillas dipped in French toast batter & cooked to perfection then filled with your favorite breakfast foods? Yes, please! Y’all, I’m about to show you your next breakfast obsession and I’m not exaggerating even a little bit. You see, I was watching Cheap Eats on the Cooking Channel and they were in Atlanta eating at Atlanta Breakfast Club where the host got French toast tacos and they looked all kinds of ah-mazing. Now, Atlanta is only like a 45 minute drive from my house so it wouldn’t be impossible to drive up there to get some, but have y’all driven in Atlanta lately? It’s so hard to do much driving there on account of the never ending deadlocked traffic, extreme amount of one way roads, & not to mention basically every street is named either Peachtree or MLK so things can get a bit a lot confusing. Yeah… I’d rather not deal with all that mess. I need to become rich enough to hire a personal driver to drive me to all the places where traffic annoys me… 😉 Every once in a while though, I do get into the ATL so next time I’m there, the Atlanta Breakfast Club is definitely a restaurant that I will be checking out! 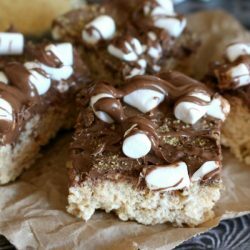 I had an instant craving hit after I watched that episode and I honestly couldn’t wait to make them. So, what did I do the very next day for breakfast? 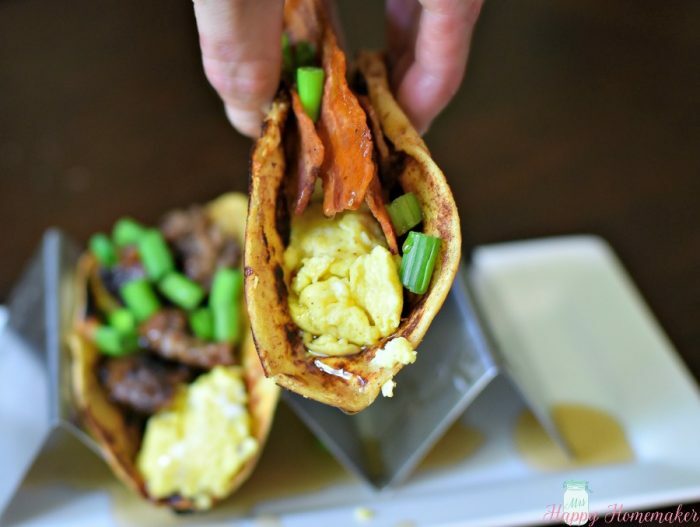 Yup, you guessed it – I made my version of these delicious sweet & savory French toast tacos! 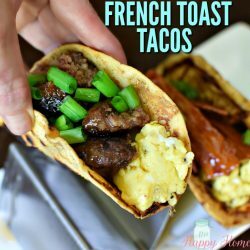 Basically, all you really need for these are eggs, bacon and/or sausage, green onions, syrup, & French toast tortillas . The tortilla French toast is completely genius. 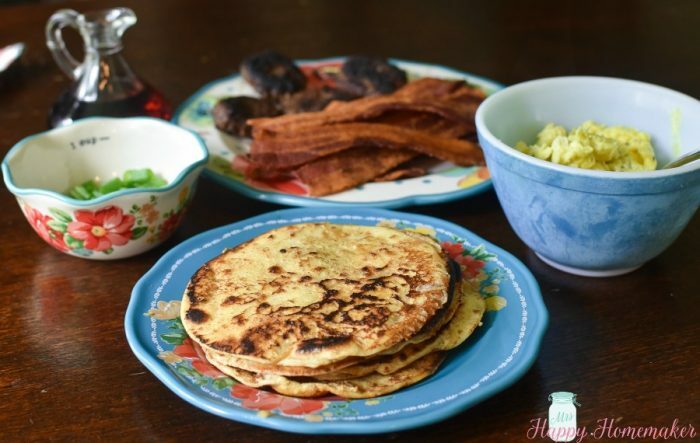 It’s just store-bought flour taco-size tortillas, dipped in a French toast batter, & cooked in a buttered skillet on each side until done (full printable recipe at the bottom of the post). The Atlanta Breakfast Club appears to use a thin omelet (without any toppings or cheese… just the egg) for their French toast tacos but I went with scrambled eggs for my own version. I cooked up both bacon & sausage so I could try each meat inside. Usually, I’m all about the bacon… but I really prefer the sausage in these. But, you use whichever you like… or do a mix like I did and everyone can make their own. I don’t know if I want to tell you how many times that I’ve had these for breakfast in the last two weeks. Ok. It was 5 times. Yes, I’ve had these 5 times in 2 weeks. Sue me. Or, just go make your own & share my French toast taco addiction. You won’t be sorry. In a large shallow dish, like a pie plate, whisk together the milk, egg, vanilla, cinnamon, & sugar. Dip the taco size flour tortillas in, one at a time, saturating both sides with French toast batter. 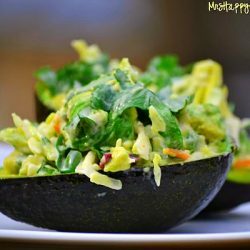 Place the coated tortillas in a hot buttered skillet. Cook on each side for a couple minutes, until the French toast tortillas have lightly browned. Remove from the pan & set aside. I like to put mine on a wire rack lined baking sheet & I keep it in the oven at 200 degrees to keep them warm while I’m preparing the remaining tortillas & cooking my scrambled eggs. 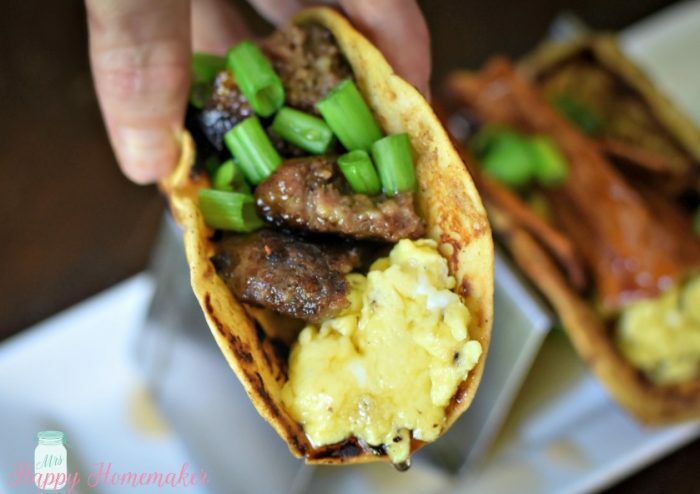 Fill your the French toast tortillas with warm scrambled eggs & bacon/sausage. Drizzle with syrup & top with chopped green onions. Serve immediately. **Increase your French toast batter as needed if you’re serving a crowd. The batter recipe provided will make about 8 tacos. Recipe adapted from a dish served at the Atlanta Breakfast Club. 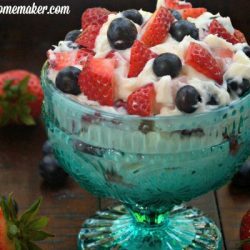 I love how fun a unique this recipe is, can’t wait to try it!